Not for modern readers, The Leavenworth Case will made the reader appreciate Sir Arthur Conan Doyle all the more. Bestselling 1878 amateur detective mystery. It sold 750,000 copies in the 15 years after its publishing. 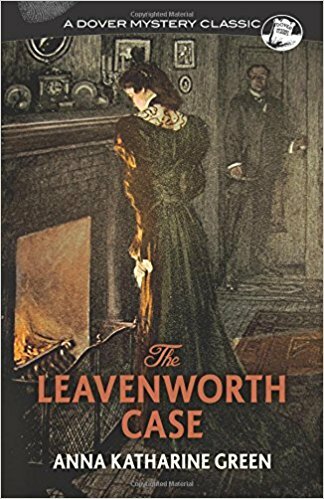 Arguably the first full length mystery written by a woman, The Leavenworth Case is narrated by Mr. Raymond, an attorney. Assisted by Mr. Gryce, a police detective and his shady operative, Q, Mr. Raymond is solving the murder of Mr. Leavenworth in his library with his own gun. Only the people within the house could have committed the crime. They included the victim’s two nieces, Mary and Elenore, who were taken in by him as young children after their parents’ deaths. Only one was set to inherit his fortune. His secretary Mr. Harwell, Thomas the butler, Katherine the cook, Molly the upstairs maid and Hannah the ladies maid were also within the house. Hannah disappeared the night of the murder with only the clothes on her back. I was looking forward to reading this historic book. Loving both Sherlock Holmes and British golden age mysteries, this book seemed perfect for me. However, the old-fashioned writing and convoluted plot ruined this book for me. The author would describe something in excruciating detail that was irrelevant to the story and then gloss over items that ended up being crucial clues. I was surprised by the sexism since the author was female. Worst was the book was just boring and seemed to go on forever. I would only recommend The Leavenworth Case to those reading it for an English class. Even then it will be a tough slog. 2 stars. Thanks to the publisher, Dover Publications, and NetGalley for an advanced copy.